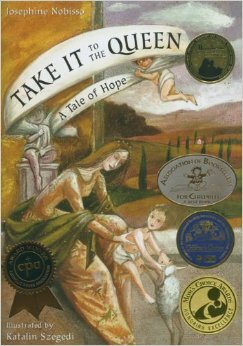 Take It to the Queen by Josephine Nobisso is an absolutely beautiful story! About six years ago, we actually found it at our library (surprise! ), and it has since become a favorite of our family’s. It is an allegory of the role Our Blessed Mother plays in salvation history. The story, on its own, is delightful, but the theological symbols that are woven throughout make the tale that much more rich and meaningful. (A great explanation of all the theological insight in this book can be found here. When I read Take It to the Queen with my children, I feel overwhelmed with awe and gratitude for God’s divine gift of Mary to us as Jesus’ mother and as our mother, our queen. My children don’t need to understand the theological depth of this book to know that the queen in the tale is like Mary. 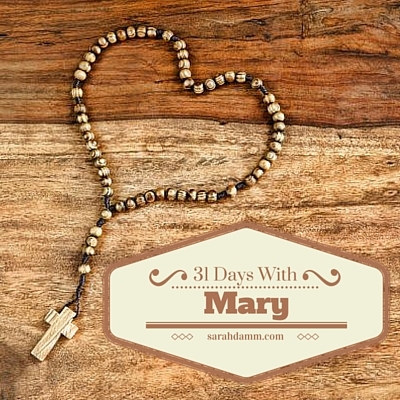 On the simplest level, how we ask Mary to pray for us, just as the villagers ask the queen to intercede for them. This story will indeed grow with my children, as they grow in their understanding of our Catholic faith. In addition to a beautiful story, the illustrations by Katalin Szegedi are gorgeous. It simply is a lovely book to look at, as my pre-reading children enjoy doing. If you haven’t had the opportunity to read this book, I encourage you to do so. Take It to the Queen makes a wonderful First Communion, birthday or Christmas gift for your family, godchildren or grandchildren. It also would look beautiful on a home altar during the months of October and May. Remember, O most gracious Virgin Mary, that never was it known that anyone who fled to thy protection, implored thy help, or sought thine intercession was left unaided. Inspired by this confidence, I fly unto thee, O Virgin of virgins, my mother; to thee I come, before thee I stand, sinful and sorrowful. O Mother of the Word Incarnate, despise not my petitions, but in thy mercy hear and answer me. Amen.